Do you want to become ultimate 2017 Corporate Team Table Tennis Champion? Then Aurora Ford Hay River and Table Tennis North would like your company to participate in this event! Paul Noel is from Belgium. He began playing Table Tennis at the age of six and by 11-years-old had joined a club. He did well through competition and would go on to obtain a Master’s in Physical Education and become a professional coach, after working his way up from an assistant coach. 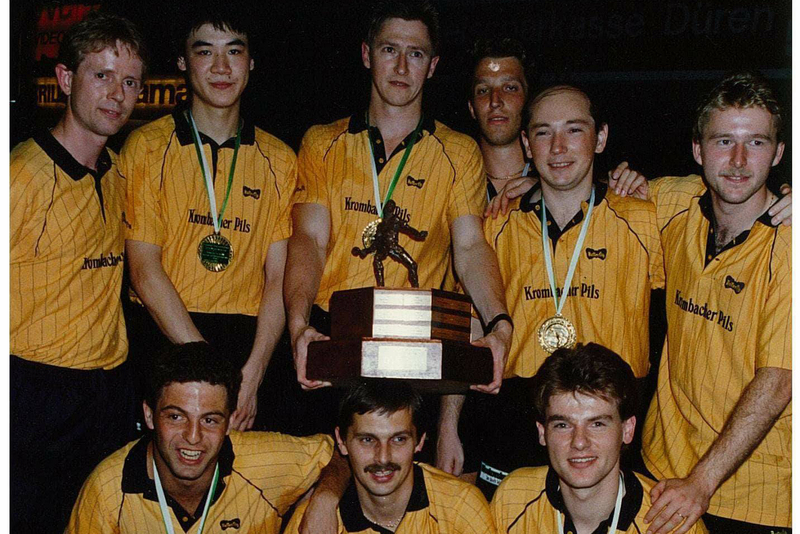 He’s been involved in Belgium, Germany, Netherlands, Luxembourg, and Saskatchewan as a coach and has enjoyed his time giving back to the sport. Table Tennis, Noel states, is a great way to build skills as children grow and develop: everything from agility, balance, coordination, catching, throwing, hitting, running, and jumping within the game. It also develops youths’ dexterity and focus as they utilize hand-eye coordination to return an opponents’ hit. 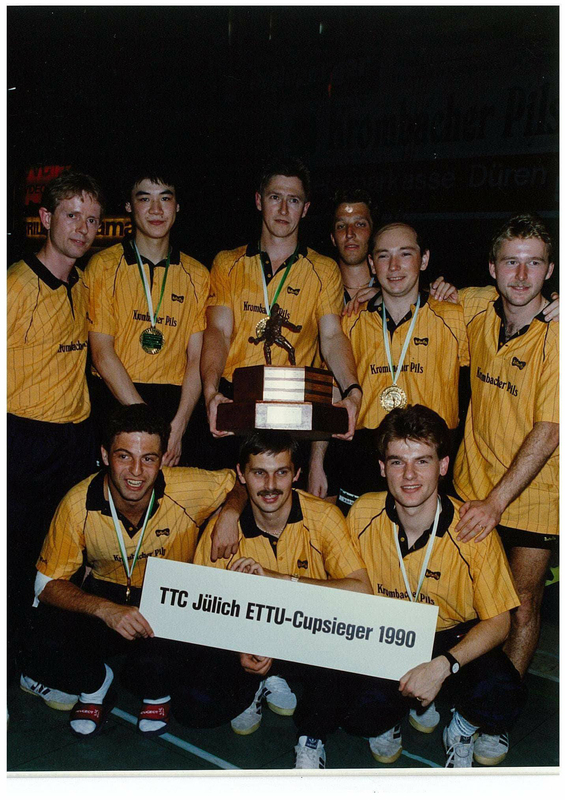 Paul was probably the youngest coach winning the European Cup during his 4 years in the German Bundesliga with TTC Jülich in the 90’s. He reached the cup final 4 times and won it 3 times during that time. Paul is since 2011 in Canada and the head coach for Table Tennis Saskatchewan, being the coach for gold medal winning Alayna Chen in the Senior Women Doubles category at the Canadian Championships. 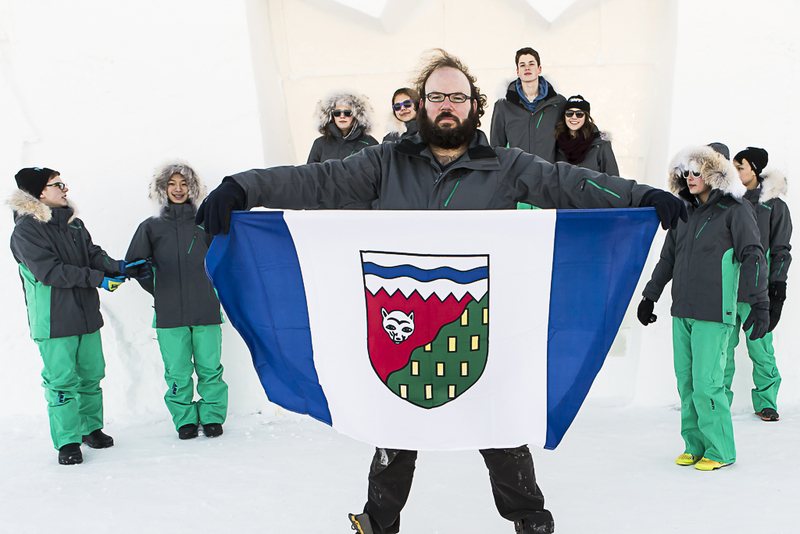 We are very excited to have Paul in the Northwest Territories! Welcome! Table Tennis North took part in the NWTRPA and Youth Centres’ Conference in Inuvik, September 28th, 2017. “We love being part of events like this” says Thorsten Gohl, who was sharing information about the growth and excitement of Table Tennis joining the North Sports Association and presenting “Table Tennis for Elders program” at the Bright Spot session of the conference. It’s a program that the Territorial Sport Organization has been hosting since 2016. The Bright Spot Presentations are about things that organizations and communities are doing well, celebrating innovation and success! 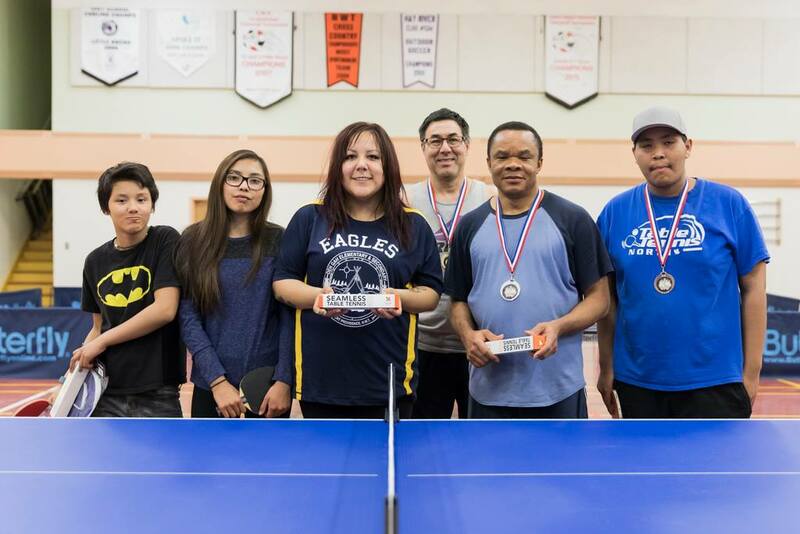 The NWTRPA was pleased to host Table Tennis North to present at our Bright Spot plenary at this year’s conference in Inuvik. The Bright Spots session focused our attention to how organizations and communities are making a difference in NWT communities, how they got their start, and tips for success. Table Tennis North showcased how their programs are building connections in our communities, building confidence in our youth, and allowing for lots of fun! 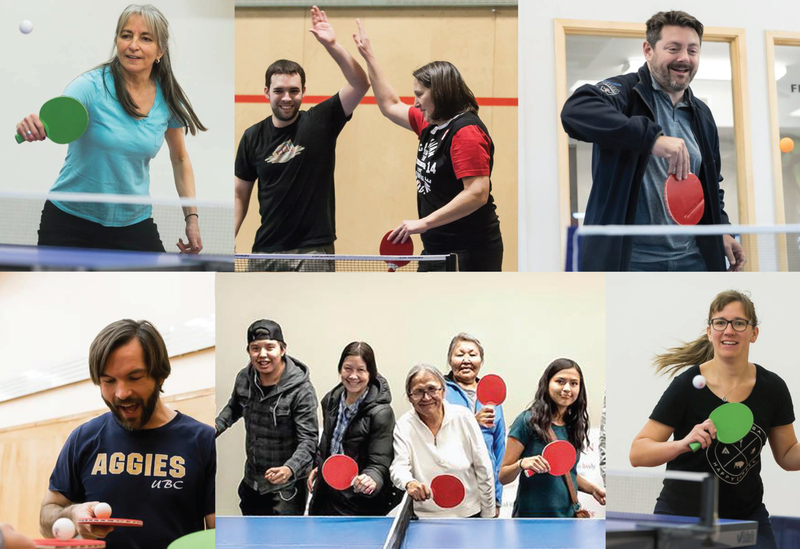 As a not-for profit organization we support, promote and develop an active, healthy and playful environment with the sport of Table Tennis in the Northwest Territories. The NWT Recreation and Parks Association works with communities across the NWT to promote healthy living through active recreation. “This is exciting. We have done a lot of ground work in the last two years in the Northwest Territories, bringing our sport into 14 communities and now having 60 professional Table Tennis tables in the communities. 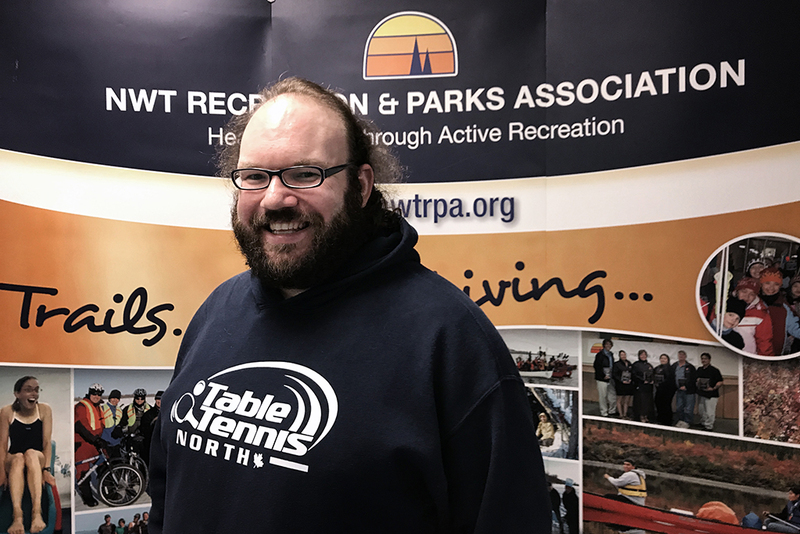 Imagine what we can do with the partnership!” says Marny Twigge, the Vice President of Table Tennis North. The Northern Ford dealership will provide the Table Tennis Association with a Ford F150 for the next two years. This is a huge milestone for the Territorial Sport Organization, being able to reach more communities with clinics, workshops and regular check ins. We are looking forward to more amazing stories and images to share from our Northern Communities, now with our Aurora Ford F150 on the road! The Aurora Group of Companies serves a wide range of automotive and industrial customers throughout the NWT. 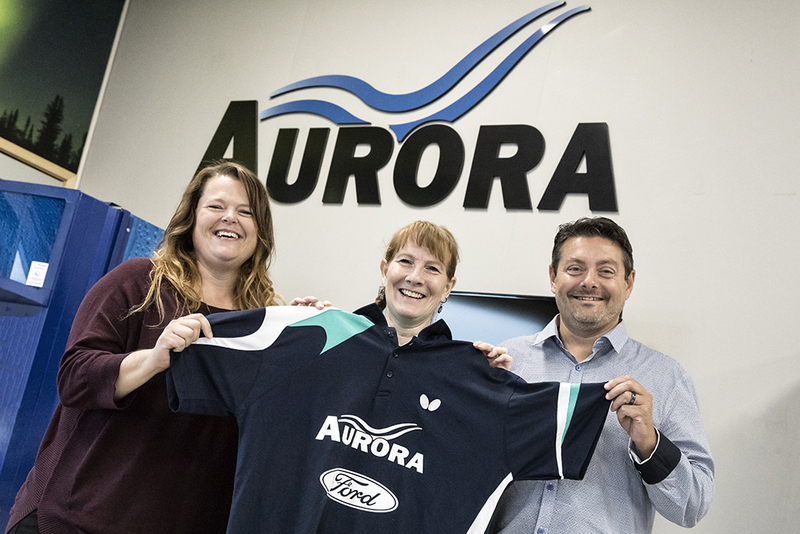 Aurora encompasses two Ford dealerships, one in Hay River & one in Yellowknife. A heavy truck franchise, recreational vehicle department, tank manufacturing and fabrication facility, automotive body shop, Esso service station, Budget Rent a car facilities and service locations at local Diamond Mines. California, June 2017 – Yellowknife’s Paul Devitt is known for his love for Table Tennis. 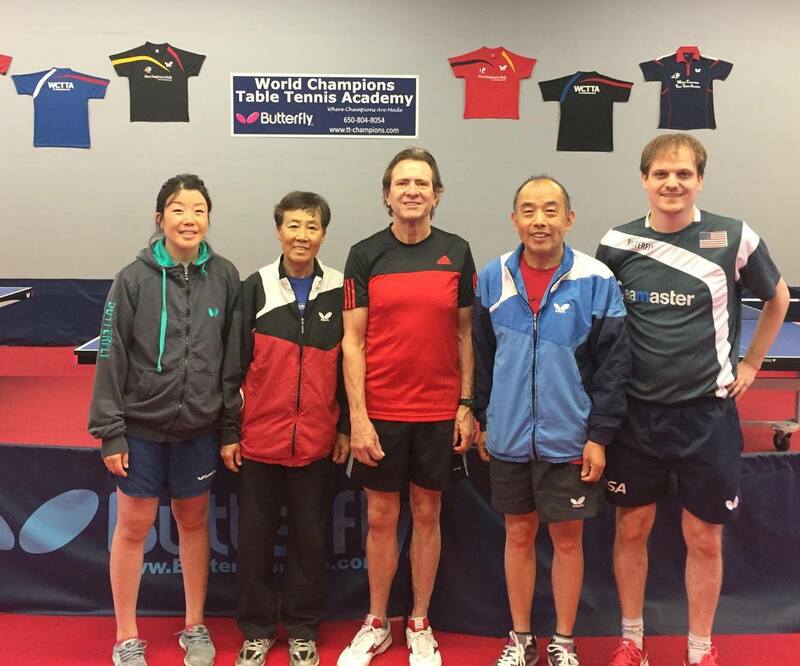 This time it brought him to the World Champion’s Table Tennis Academy in California, the home of US Men’s National Team player JHA Kanak and his coach Stefan Feth. “Zhang, Li, Nan, and Stefan are great people and amazing coaches. They did an excellent job organizing the camp and showing me what I needed to focus on to improve my game” Paul shared about his experience at the Academy. Well done Paul!! Inspiring for us, seeing you improving your game, and representing the Northwest Territories with pride! “And the winner is …” – 2016 Table Tennis North Award winner is known! The Board has decided to award Thorsten Gohl with the Volunteer and Coach of the Year Award for 2016. Congratulations and THANK YOU Thorsten! JBT Elementary School was a great host for this Arctic Winter Games test event. The staff and teachers were excited to host Table Tennis North and Aerobic Table Tennis during the week and in preparation for the event, we had a lot of helping hands. Fort Smith, Fort Resolution, Fort Providence and Hay River participated in the games with a total of 18 Athletes over 2 days. During the week Table Tennis North and MACA hosted an Officials and Coaching Clinic were a total of 19 participants got their first introduction to Community Table Tennis Coaching and Introduction to Officiating. Norman Tang, Board of Directors of Table Tennis Canada, came to host the Officials Clinic and was the Referee for the tournament. “I would like to participate in the tournament. Winning or loosing, it does not matter. As long as I have fun” said 9 year old Sheena who just started playing Table Tennis a few month ago. She was also the umpire for the finals of the Junior event. 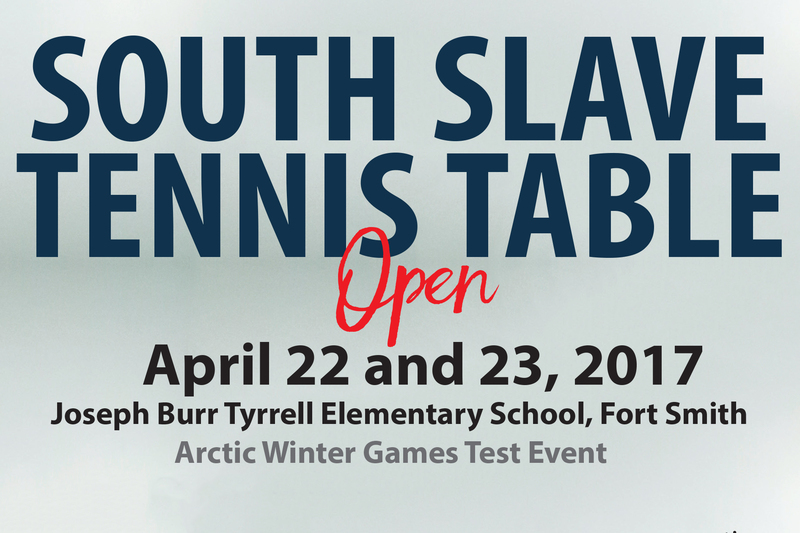 JBT Elementary will be the host of the 2018 South Slave Arctic Winter Games for Table Tennis and we are excited about it. “It will definitely be one of the best events of the Games” says Executive Director Thor Gohl. And we believe him! Congratulations to the winners of the Open and Women’s category of the 2017 Aurora Ford Sales South Slave Open as well as all the participants. The 2017 Aurora Ford South Slave Open will be hosted from April 22nd to 23rd, 2017 at JBT Elementary School in Fort Smith. This will be an Arctic Winter Games test event, in the venue of the 2018 South Slave Arctic Winter Games. Let us know if you like to stay at the school. Depending on participants, we will play best out of 3 or best out of 5. We will follow the rules of the International Table Tennis Federation. If you have any questions, please contact info@tabletennisnorth.ca and we will be happy to help you. Deadline for registration is April 17th 2017. For registration, please send and e-mail to info@tabletennisnorth.ca with the following information: First Name, Last Name, Community, Birth Date and mention what 2 single categories and 1 double category you want to participate in. Also, please let us know if you want to stay at the school and/or want to eat at the school. If you have any more questions, please contact info@tabletennisnorth.ca. Thank you! We are looking forward to seeing you in Fort Smith!!! 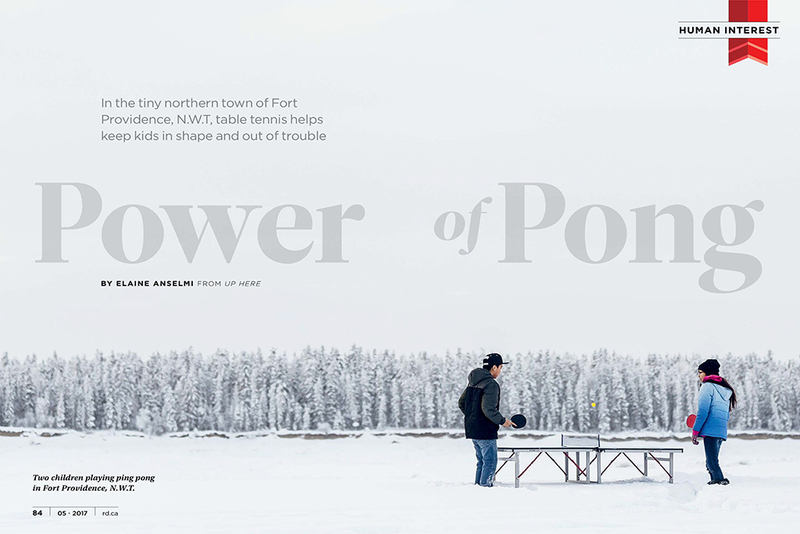 Table Tennis is growing in the Northwest Territories and with it is healthy living and being active. We have reached 13 communities so far and working on projects in the new fiscal year to reach even more. We have played Table Tennis with over 2,000 children in just the last 18 month. The word is out there, now it is time to manifest it, create leaders in communities and build a base. We are very fortunate to have so much support from our partners, sponsors and the communities. Without that, we would be nothing. The media also plays a big role and next to being featured many times in local newspapers, we are very lucky to have had an article in UP HERE Magazine and in May 2017 we will be featured in Readers Digest Magazine as well. Check out the full article right HERE. A beautiful article by Elaine Anselmi from UP HERE. 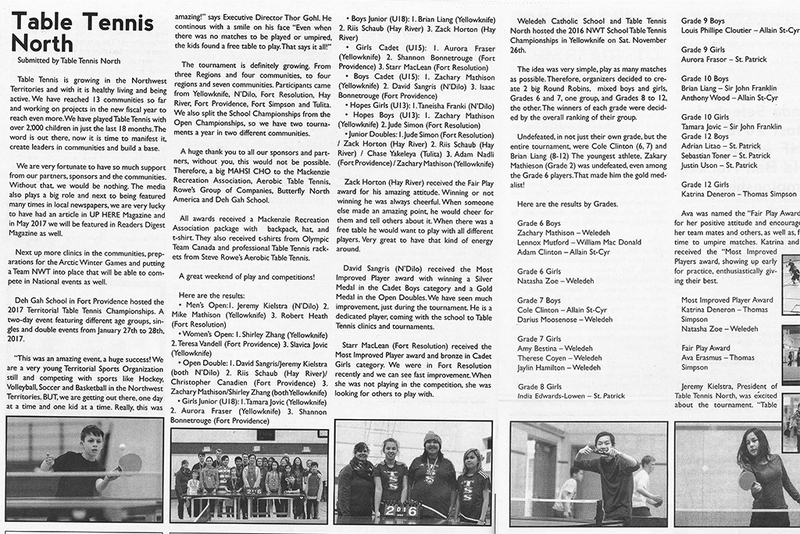 A wonderful article to support our vision to promote and develop an active, healthy and fun environment with the sport of Table Tennis in the Northwest Territories. 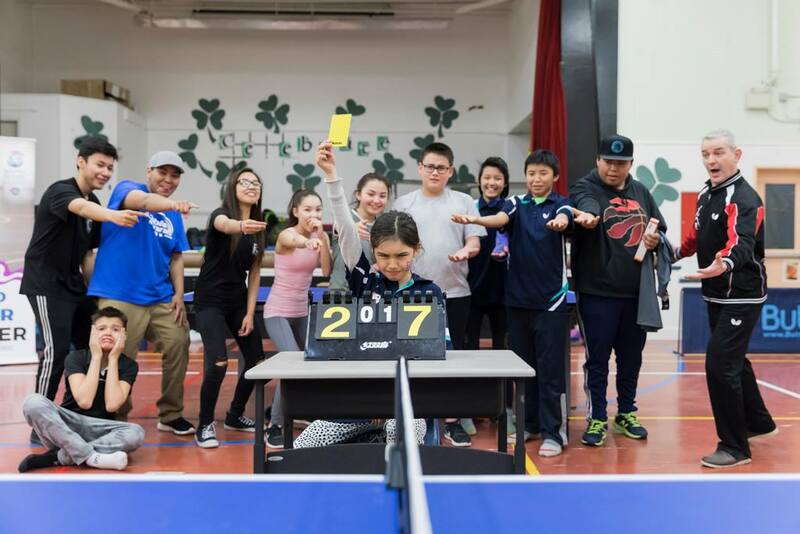 One huge supporter of Table Tennis in the Northwest Territories is Principal of Deh Gah School in Fort Providence, Lois Phillip. “It’s about creating opportunities and creating a safe space,” says Lois. “A safe space where kids can be kids.” And that is what we are trying to do with Fort Providence, and also bring our multi seasonal sport into other communities, creating those same opportunities and fun, safe spaces. Once we reach the communities, it is about keeping involved. One hopes by being constant, being the role models that we can be, it will make a difference in their lives. “I must say, I’m a dreamer and crazy sometimes,” Gohl says. “I said when I came here, in a year’s time, I want to do 20 communities.” He made his move to Fort Providence in September 2015, and while 20 may have been a lofty goal, he’s already hit 13. We will definitely hit 20 communities by the end of our 2 year anniversary as a Territorial Sport Organization, but more important, we want to go back to those communities as much as we can, support them how ever possible, and see the sport grow in participation, with increased health and focus with time for all ages. “Table Tennis is becoming more than just something to do” is how the article ends and that is very true. We have seen an immense growth of participation and interest in the Sport of Table Tennis in the North and we are looking forward to more excitement in the future. BUY the magazine or read our article right HERE.